This homepage was designed for the newly founded Biotechnology Institute Thurgau, Switzerland. The logo was designed by an ad agency, so the homepage had to follow this existing design. 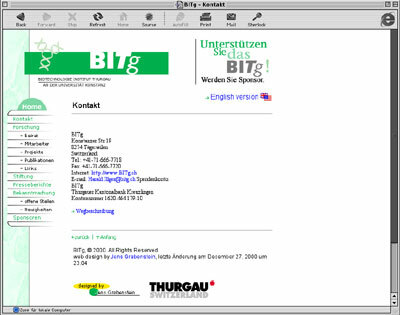 Shades of the green color of the logo and the use of sans-serif fonts in the navigation bar integrate the logo into the homepage. The navigation menu is the essential part of this web site. Submenus in black ease the navigation.